Walk Worthy Press, 9780446677837, 400pp. Kyla and Jefferson Blake count their 16 years together as a wonderful blessing from God. Their marriage is passionate, their daughter is a joy, Jefferson's medial career is prospering and they have loyal friends. Kyla knows her newly divorced and lifelong friend, Jasmine, is desperately unhappy and no amount of prayer or encouragement seems to help. But what Kyla doesn't know is that Jasmine has a plan to move her life forward with the type of man she feels she should have married in the first place. Alexis Ward, Kyla's, best friend, is single and successful and willing to wait for the right man for all the right reasons. But, when "Mr. Right," Dr. Brian Lewis, finally appears she finds herself facing a new challenge. Does she really have to walk away from what she believes in order to have a man in her life? As people who love God, Kyla, Jefferson and Alexis discover, each in their own way, what happens when they truly allow God to be first in their relationships. 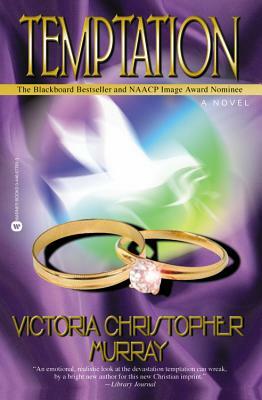 Full of contemporary characters who struggle to keep their strength, friendships and daily lives framed by the Word of God, Temptation is a novel no reader will soon forget.